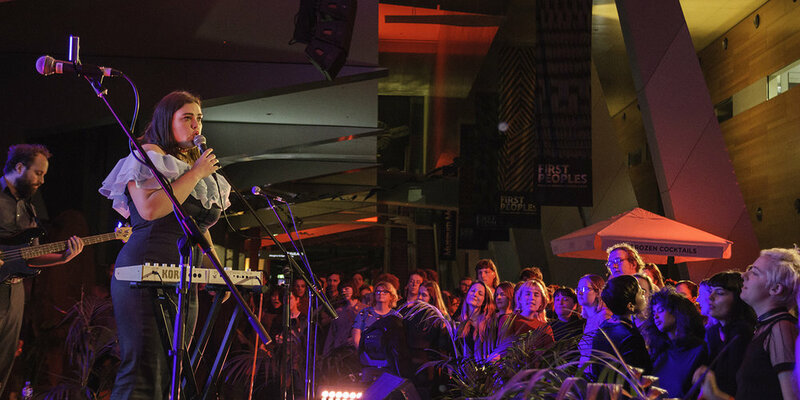 Held on the first Friday of every month, Melbourne Museum’s Nocturnal has established itself as a highlight of Melbourne’s live music and cultural scenes. On Friday 4 May, guests were treated to a special offering hosted by the Museum in collaboration with independent record label and management collective Our Golden Friend. The artists on display included Jade Imagine, RVG, Jess Ribeiro and Totally Mild, each of which is managed by Our Golden Friend. The ensemble recently concluded a tour across the United States in March, giving Nocturnal the feel of a happy family reunion which happened to feature some of the most unique and promising talents in Australian music. 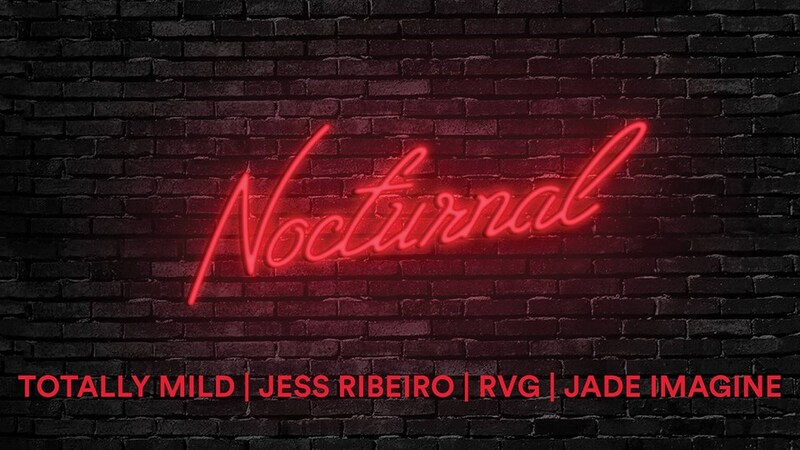 Before recapping the performances, it’s worth reflecting on how extraordinary Nocturnal is as an interactive venue and immersive experience. Located in the Edenic Carlton Gardens, the postmodern Melbourne Museum is transformed into an otherworldly “adult playground” with an impressive array of bars and other dining options. The exhibits are open to the public for exploration, including the stunning Vikings: Beyond the Legend, Te Vainui O Pasifika, and Dinosaur Walk. We are encouraged to re-experience the childlike sense of wonderment, awe and discovery that children have when they step into a museum. Walking through the exhibitions while sipping a glass of red, we marvel at the graceful beauty of a Blue Whale skeleton suspended in mid-air; we are humbled by fully reconstructed dinosaur skeletons from hundreds of millions of years ago; and we are baffled and filled with existential dread at the sight of an Australian moth, which, having spent months gestating in its cocoon, emerges into the full splendour of its adulthood without ‘any functioning mouth parts’, according to one of the Museum’s scientists present at Nocturnal. Denied all culinary pleasures, the moth’s sole purpose in life is to enjoy a brief autumnal period of fornication to reproduce its species (which is more than I can hope for). Keeping the themes of discovery and contemplation of the sublime in mind, patrons flocked to the main stage at 7:30pm to see Melbourne indie staples Jade Imagine take the stage. Resplendent in her pink power suit, black RM Williams boots, and orange polka-dot socks, lead singer Jade McInally (Teeth & Tongue) created an ethereal aesthetic and atmosphere which suited Nocturnal perfectly. She was brilliantly supported by guitarist Tim Harvey, his brother James Harvey on drums, and bassist Liam ‘Snowy’ Halliwell. With their dream-pop, low-fi and folksy sound evoking The Shins, Simon & Garfunkel, and Sibylle Baier, Jade Imagine were spellbinding to watch live. As an ensemble, Jade Imagine have gone through many incarnations, but this line up of performers feels just right. Patrons enjoyed much-loved staples such as Walkin’ Around, Stay Awake and Esteem. Each band member also performs as a vocalist, which Jade Imagine used to great effect on stage through harmonization to create a dreamy wall of sound, which feels like they’re wrapping you up in a big hug. Their musical style supports the band’s deeply evocative and poetic lyrics, which sometimes border on magical realism. One of the most anticipated acts of Nocturnal was RVG at 9pm, led by the sensational frontwoman Romy Vager. Despite Romy battling through sickness, RVG put on an electric and rollicking performance which had the crowd in raptures. Having released their debut album A Quality of Mercy (Our Golden Friend/Island Records) in August 2017, the band has already picked up a suite of awards including four nominations each for The Age Music Victoria Awards and the AIR Music Awards. The enigmatic Jess Ribeiro took the stage at 10pm. Patrons were enveloped by the smoky texture of lead-singer Jess’s voice, which is informed by the diverse hinterland of her travels and musical background. It’s been a remarkable personal and creative journey for the talented frontwoman, ranging from the outback and tropics of the Northern Territory to the urban wintriness of Melbourne. 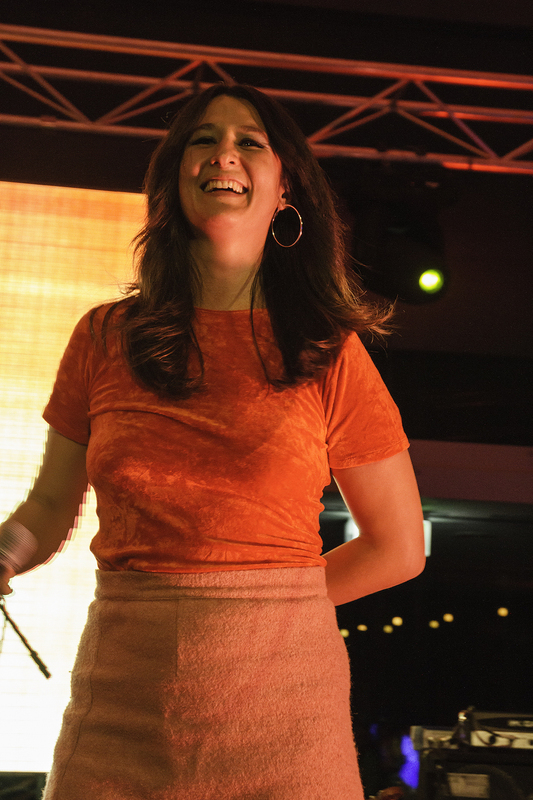 Along the way Jess has found critical acclaim in with My Little River (2012), which won the ABC Radio National Album of the Year and Best Country Album (AIR). This dusky country feel came through at the Museum, where the band performed tracks such as “Hurry Back to Love”, “Slip The Leash” and “Strange Game”. Rounding out the evening was Melbourne lush quartet Totally Mild, who took to the stage at 11pm. Frontwoman Elizabeth Mitchell was sublime and at her charming and magnetic best. Her angelic and versatile voice enchanted the crowd, and one could feel the influence of her choral background coursing through her. She was brilliantly supported by the intricate sounds of guitarist Zachary Schneider, the subtle indie drumming of Dylan Young, and rolling bass of Lehmann Smith. Totally Mild make for disorienting performers. You’re so beguiled by the heady, atmospheric sweetness of their musical stylings and by the band’s extroverted stage presence that you miss the dark and brooding nature of their lyrics, best exemplified by their Christa. I think this makes their music more impactful and compelling, as it enables Mitchell to speak about highly-sensitive topics such as depression and loneliness in subtle, disarming ways. I have been utterly transfixed by the music and story of the late Amy Winehouse since mid-December 2017, when I saw Thando perform on a Thursday evening at the Jewish Museum of Australia as part of an impressive range of events accompanying its Amy Winehouse: A Family Portrait exhibition. In February I attended the outstanding Amy Winehouse Tribute Concert at Memo Music Hall in St Kilda, which played host to some of the premier jazz and soul talents in Australia. My desire to know more about this unforgettable woman and talent drove me back to the exhibition for a second time. Created in 2013 and curated by Amy’s brother Alex Winehouse, the exhibition has toured successfully through Vienna, Tel Aviv, Amsterdam and San Francisco, and leaves Melbourne in less than a week on March 25. Alex was adamant that the exhibition be held at the Jewish Museum of Australia, and for good reason. A Family Portrait is featured alongside The First Waves – Russian Jewish Migration, 1881-1922, which explores the parallel migration of Russian Jews to Australia. Both temporary exhibitions are displayed against the backdrop of the permanent features of the Jewish Museum, which helps us to appreciate the scale and variety of Jewish stories across time and space. The permanent and temporary exhibitions flow into one another seamlessly. Moving down the corridors from the deep history of the Jewish people to Amy Winehouse: A Family Portrait, one is encouraged to reflect on the relationship between the individual and the ineluctable historical forces which shape us. With such perspective, one comes to view Amy’s Family Portrait as but one flourishing and tragic human story amidst the millions of others throughout history. This is poignant, since Jacques Wengrow’s The Holocaust sits metres from the entrance to Amy’s exhibition. The haunting and arresting painting depicts over 6,000 anonymous figures as a memorial to the six million Jews who were murdered in the Shoah. This caused me to reflect on Isaiah 51:12, where humans are said to “wither like the grass and disappear”. Given what I have described above about historical forces, perhaps another analogy to understand the transience of human existence is the Tree of Life, in which individual human lives are like leaves blooming and wilting with the seasons; determined and sustained by the roots, trunk and branches of culture, religion, ethnicity, language, and so on. Walking up the steps of the Museum on Alma Rd (fittingly, Spanish for soul), I was immediately struck by the glowing Mediterranean beauty of Amy’s visage, probably informed by her Belarusian Ashkenazi Jewish extraction. Set against the St Kilda palm fronds, Amy resembled a modern-day Cleopatra, resplendent with her bronzed skin, black hair, and depending on the light, her olive green, hazel or even golden eyes. If you can think of life, for a moment, as a large house with a nursery, living and dining rooms, bedrooms, study and so forth, all unfamiliar and bright, the chapters which follow are, in a way, like looking through the windows of this house. Certain occupants will be glimpsed only briefly. Visitors come and go. At some windows, you may wish to stay longer, but alas. As with any house, all within cannot be seen”. Gazing upon the family portraits on the wall upon entering the exhibition, one has the almost-uncomfortable sense of fossicking about a family’s unattended living room, poring over private photo albums and polaroids which have been unseen for decades. Vividly colourful displays pop out from hospital-white walls, while a soundtrack inspired by Amy’s “Chill Out Tape” plays unobtrusively in the background. The overall effect is of entering a dreamscape, in which time has stood still. It is in this sense that one can appreciate A Family Portrait as part of the Winehouse family’s grieving process; a kind of extended Kaddish. It’s hard to hold back tears while wandering through this beautiful garden of memories dripping with the dew of nostalgia and vulnerability. This is how the Winehouse family remember their little girl before she dropped from the Tree in the full flourishing of her spring and summer, never to know the autumn and winter of life’s journey. Set in the curved corner of the Museum, we are stepped chronologically through vignettes of Amy’s life, made sweeter and more powerful by reminiscence and the passing of time. At the beginning is a suitcase full of beautiful polaroids and kodak prints which Amy had hoarded from various family members over the years, which she was examining in the days before her death on 23 July 2011. The next station we come to is a sprawling family tree, which throws into high relief the intermingling continuum of disparate histories and geographies that combined to form Amy and her family. Below the family tree sits Amy’s school tie and jumper from Osidge, almost as if it was prepared for the first day of the school year. Adjacent is Roden’s ‘The Book of Jewish Food’ with an excerpted recipe for chicken noodle soup, once requested by Amy, and poorly made. (Unlike her meatballs, we are told). We learn that Amy’s great grandfather Harris Winehouse (Weinhaus) came to London from Minsk, Belarus by mistake in 1890, and that she loved Snoopy, Dr Seuss, and Postman Pat. Moving from the historical and geographical contextualisation of the exhibition, we come to the vignettes which focus on Amy’s musical influences. 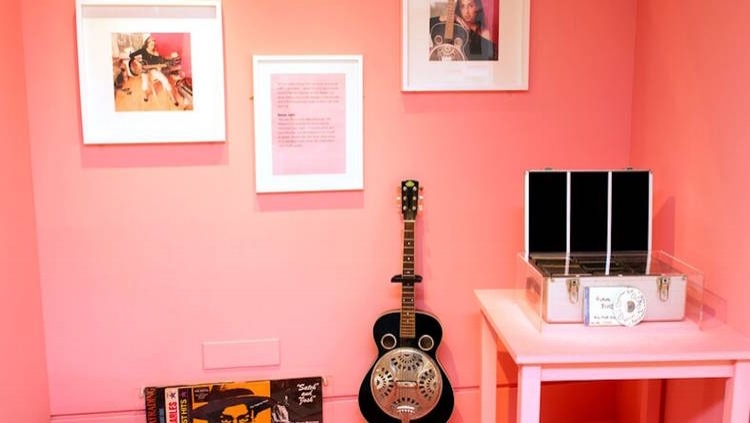 Inset in a stunningly soft pink alcove is Amy’s favourite guitar, along with her music collection. We are informed that Amy developed her love of vinyl from her mother, and that she spent hours in Camden record stores. It is always instructive to read about an artist’s musical influences, but quite another thing to cast one’s eyes on the very CDs and vinyls which they spent hours listening to. In attendance are Quincy Jones’ Big Bad Bossa Nova, Bobby Darin’s That’s All, an album from Dinah Washington and plenty of Ray Charles. Once realised, one cannot but hear these influences coursing through Amy’s catalogue. my brother started listening to jazz when he was about 18 and I was 14, and I just remember the first time I ever heard ‘Round Midnight’ by Thelonious Monk through the wall, and I was just like: ‘what is that?’ I’ll never forget that. Life is stochastic. Just as Harris Winehouse settled in London by mistake, so too did Amy discover jazz by chance, seemingly because of her brother’s musical taste. 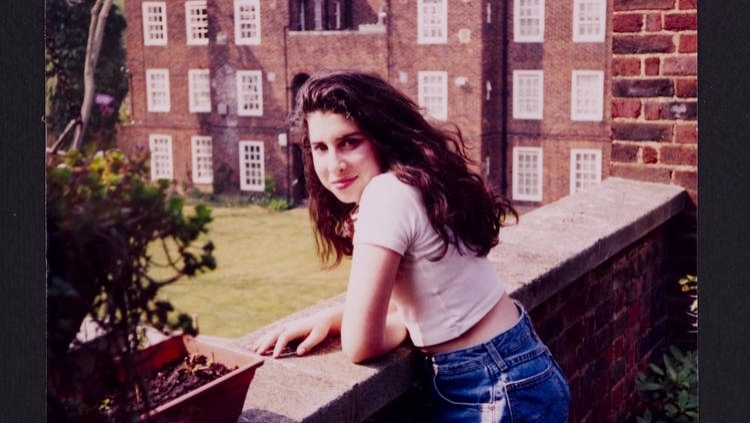 We therefore not only appreciate how the Winehouse family developed in relation to the deep histories of the Jewish people and diaspora, but also how Amy was shaped in relation to her family. This is a deeply humbling notion which helps us to understand the fragility and interconnectedness of all things. but mostly I have this dream to be very famous. To work on stage. It’s a lifelong ambition. I want people to hear my voice and just forget their troubles for five minutes. And so they did, and still do. The penultimate section of the exhibition surveys Amy at the height of her powers as a fashion icon and, as described by the BBC, ‘the pre-eminent vocal talent of her generation’. This section teases out the duality of the public and private selves. Beneath a quote from 2010 “I still dress like it’s the 50s”, we see the famous navy blue sequined Luella dress from Glastonbury, and the Christian Louboutin shoes. Amy’s tattoos, designed by Henry Hate, are also explained with tenderness as references ‘to her life and loves’. The most memorable on her right arm is described as a tribute to her nan Cynthia and her eternal youthfulness and ‘va va voom’. We are invited into Amy’s library, and see how she read Dostoevsky, Bukowski’s Notes of a Dirty Old Man, and Hunter S. Thompson’s Kingdom of Fear, and learn how she loved all things vintage and retro, collecting fridge magnets and transistor radios. Quirky little things, which each of us could list about our own siblings and family. The final stages of the exhibit include a posthumous Grammy from her Body and Soul duet with Tony Bennett, adjacent to two beautiful bird cages which Amy owned (sans birds, except for one short-lived canary). The symbol of the uncaged bird informed the logo of the Amy Winehouse Foundation, which has carried on the good but relatively unknown charitable works that Amy did while living. What is left out of the display is as profound as what is included. There are no images of Blake Civil-Fielder, who in many ways both made and destroyed Amy. There are no pictures of the skeletal and slack-jawed Amy after she was ravaged by her addiction to cigarettes, drugs and alcohol; after she began to decay inside and out through a host of mental and physical illnesses, most visibly anorexia and bulimia, but also invisibly through early-stage emphysema. We are so accustomed to hearing about Amy as described above: in flashing lights, at the sell-out concerts, and through the ill-repute generated from the ravenous paparazzi and gossip magazines documenting her downward spiral and self-destruction. What this exhibit has encouraged us to do instead is to honour the wish of that 14-year-old girl, to remember her as ‘me’. The final video of the exhibition brings together all that we have learned about Amy and her family’s precious private life and reconnects us with how we all invariably came to know her, through the indescribably sublime and transcendent power of her voice. Which 21st century artist has distilled and articulated the vulnerabilities and vagaries of love as she did? Which other 17-year old could sing about the youthful exuberance of adolescent independence and aversion to romance as she did in My Own Way, echoing Sinatra? Who could then sing at 20 on Jools Holland, and with such maturity, of the terminal frustrations of long-term relationships and the complexities of gender roles in Stronger Than Me? Who else could, at 26, encapsulate the utter devastation of a break-up as Amy does in Wake Up Alone? ‘He’s fierce in my dreams, seizing my guts / He floats me with dread / Soaked in soul / He swims in my eyes by the bed”? Even through their death, who else could render the words of A Song For You with more extraordinarily beautiful and eternal meaning? "And when my life is over / Remember when we were together / We were alone / And I was singing this song to you / I love you in a place / Where there's no space or time"
The answer is no one. And so we are left to leave the exhibition contemplating the tragedy of this loss, and the irreversible silencing of this great human voice. The mind boggles at the fortuitous and unrepeatable randomness that went into the making of Amy Winehouse, especially when we consider the full sweep of Jewish history and her own family story. This uniquely beautiful person who felt so deeply, loved so intensely, shone so brightly, and then was gone. 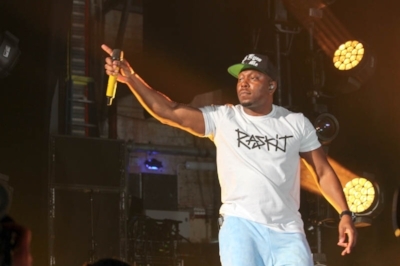 I hadn’t really thought about or listened to Dizzee Rascal since I saw him live 8(!) years ago on a dangerously hot Australia Day in 2010 at the great but ill-fated Big Day Out. I was 17, and able to support two friends on my shoulders jumping to Bonkers with 20,000 other enraptured patrons at Melbourne’s Flemington Racecourse. I had just discovered Dizzee through Tongue ‘N Cheek in late 2009. That brilliant album, sometimes derided by implacable reviewers in The Guardian for its commercial detour to Armand Van Helden and Calvin Harris, introduced me and millions of others to Dizzee and the then-flowering genre of London Grime. By way of further context, Dizzee’s electronically-luscious hits Holiday, Dirtee Cash, Dance Wiv Me, and Bonkers provided the soundtrack to me falling for my first great love at the similarly ill-fated Pyramid Rock Festival in 2009-10. There we revelled in youth, sun, sea and curly hair on Phillip Island, without the tedious and HR-inspired ‘good life partner’ metrics that plague one’s mid-20s. And so it goes. Thus it was without hesitation that I accepted a last-minute invitation to attend Dizzee’s intimate gig at the stunning Forum Melbourne on a balmy Tuesday summer evening. I spent two full days schooling up on his broader catalogue, and in particular his newest and sixth studio album Raskit (2017), which he was in town to promote. Immediately returning to his Grimy roots, Mr Rascal opened his set with the lyrically brilliant Space. It is a sparse, bent, and angry anthem which reveals a maturation in Dizzee’s musical oeuvre and his lyrical and poetic development since he blew up in 2002. Here, Rascal cast the semblance of a brooding Prince Hamlet. His icy and staccato speech was fractured and words fired from his mouth like bullets from a machine gun, betraying an almost paranoid and under-siege psyche (perhaps from mixed reviews about The Fifth? ): “I’ve been through hell and I’ve swallowed the ashes, / running this ting for so long as it happens, / I’m knackered, / All of my enemies broken and shattered, / sprinkling hate, / they’re all over the shop and they’re scattered”. Listen to the track and find yourself reading the rest of this piece in Dizzee’s irresistible Jafaican (Multicultural London English) accent and trochaic pentameter, with its bouncy glottal stops and juicy vowels. Following this outstanding, swaggering and brooding opening, the punters were treated to a series of his grimy but unrelatable tracks (at least for Melburnians) – such as Ghost, Wot U Gonna Do and Make It Last. Disappointingly, Dizzee didn’t perform Raskit’s brilliant and relevant opening track Focus. It goes without saying that everyone enjoyed the filthy resounding bass and impressive lyrical dexterity of each track (my ears are still aching four days on), but many songs in the opening half of the gig lacked a certain je ne sais quoi. Fortunately, the punters were thrown a life rope with his exquisite Jus’ A Rascal (2003) about ten tracks deep, a tune which strikes that stunning balance between Grime and broader commercial appeal. Reeling us in from all corners of the Forum, Dizzee resuscitated us with a barrage of his classic hits that we had all come to see (at least according to my market research at The Duke of Wellington beforehand). Drunk on nostalgia, we were treated to Fix Up, Look Sharp, the great and catchy new hit from Raskit Bop n’ Keep it Dippin, followed by the unbeatable flow of Heavy, Bassline Junkie, Dance Wiv Me, and Holiday. Dizzee then busted out You Got the Dirtee Love - that superb collaboration with Florence and the Machine - before informing the ecstatic crowd that he had breached Melbourne’s curfew regulations and had to leave the stage. This being Australia, half of the crowd (me included) believed him and resigned ourselves to filing out of the venue in an orderly manner. He returned triumphantly moments later, with the smile on his face and the lights illuminating the stage, to inform us that he “was jus’ jokin' wiv ya”. Perched in the corner of Abbotsford’s Marfa Gallery sat Mark Chu’s portrait of his great artistic influence, Francis Bacon, gloomily observing the throngs as they inspected the 79 other works neatly arranged throughout the OPUS exhibition from February 1-4. A noted hedonist and boozer, one wonders how wistfully Bacon’s portrait looked on during Thursday’s opening event, which was attended by some 300 persons from all walks of life. Grotesque with its sagged jowls, recessed eye sockets and paunchy flesh, Bacon resembled a bemused ‘Picture of Dorian Gray’; that famous painting locked in an attic and made hideous by its creator's lifetime of hedonism and debauchery in exchange for the artist's eternal youth and beauty (until Faust’s debts were called in of course). Geometrically un-experimental, and the colours dank and almost fungal, except for the licks of hell flame, this painting stood in stark contrast to the vivid and playful colouring of the rest of Chu’s exhibit. I found myself at the OPUS exhibit after a chance encounter with Chu in front of the State Library. Briefly in Melbourne following four years living and working in New York City, he was running an innovative pop-up called Art Pay$ in collaboration with Exile Entertainment; together they aimed to break the stereotype of the impoverished artist. After drawing a five-minute sketch of Chu I was paid a handy $20 for my labour, thereby becoming a commissioned artist (which I immediately added to my LinkedIn profile). I also received the additional honour of having my portrait featured in the Marfa studio along with 15 other nouveau-artists. The rest of the exhibit was equally as jarring and thought-provoking. When unpacking Chu’s work, a good starting point is Nadia Boulala (below), which helped me understand the influence of the Cubists on his style. Quizzical faces are mangled into kaleidoscopic abstraction, as if pinched and discombobulated on some Apple Mac application, and then given life by Chu’s brilliant gestural brushwork. Despite the distortions, one is able to discern the human face, a phenomenon reflected on by Chu in this very good profile by Convicts.NYC. Eyeball sagging from her left socket – not unlike that appalling scene from Hostel (2005) – Nadia retains an essential feminine beauty in her pointed cheekbones, luscious lips, and delicate nose, each feature constructed from different geometrical shapes and accentuated by the contrasting lighter tonal colours in the background. My favourite portrait was Cosmetic Fear IV (below). It had resonances of an elegant, demure and alien-looking Audrey Hepburn. As suggested by the very kind and knowledgeable Alexi Ouzas, Manager at Exile Entertainment, Chu’s inclusion of the colour palette on either side of Hepburn broke down the wall between the artist and the subject, where the subject is normally entirely oblivious to the colour palette being used to create their portrait. This trope of breaking down barriers to understanding art was also demonstrated through the Art Pay$ exhibition, and was a very thoughtful inclusion to the whole OPUS experience. Much of Chu’s work demonstrates a fascination with the down-and-out, austere and dysfunctional aspects of the human condition. The sadness of Lucien Freud’s subjects can be found in many of Chu’s portraits. Witness Julio (below), a New York local who entered into his own Dorian Gray Faustian Pact by agreeing to have his photo taken for a portrait in exchange for one of Mark’s cigarettes. Or consider, perhaps, the honest and deeply personal triptych Why Have You Foresaken Me? Which recreates Bacon’s Triptych, 1976, with an anguished and contorted Chu sprawled on a canvas overshadowing his lover, who is draped languidly across a rug with wine stains on the carpet. Here, Chu considers the impact of his art and lifestyle on his partner. (Probably). I am prone to lapse (prolapse?) into panegyrics, but Chu has always struck me as an endless font of great creative potential, be it in music (he has recorded as a solo pianist for the MSO and WASO), or in creative writing (featured in The Lifted Brow and an MFA from Columbia University in NYC). Given that he now seems to have substantially turned his attention to art and painting, I feel certain that he could not only win something like the Archibald Prize, soon, but also make a broader impact in the world of painting and portraiture through his life’s work. He is certainly much younger than Bacon was when the latter began honing his craft in his late 30s. I recall three vivid fragments from the last decade and a bit of knowing Chu at the overlapping peripheries of our social circles. The first image is him sitting serenely atop a ziggurat overlooking a green football field – shirt untucked and in his final year of high school in 2006 - working on complex specialist maths problems. The second is probably from 2009 at a mutual friend’s beach house on Victoria’s surf coast, where he calmly counselled me about the need not to care about what others thought of me. (I had become embroiled in some beachside internecine summer feud, of Mercutio-Tybalt proportions in Luhrmann’s R+J). The third vignette is from his St Kilda Road apartment in 2011 while he was doing a lot of creative writing – books piled up to the ceiling - and he kindly and patiently offered me advice about career and study direction, me being at a loose end. We spoke about my new-found vegetarianism, how he didn’t agree with it, and how he would gladly eat whale meat in Japan. All three of these interactions inform a lot of my understanding of Chu and his work in OPUS: the out-of-the-box intellectual who chose to tap into his creative wellsprings and passions rather than follow his successes into the professions; the anchored and almost serene man not riven by the opinions of others or by status anxiety; and the kind person moved (and bemused?) by the foibles of human beings and the human experience, but seemingly benignly indifferent (in his artwork at least) to broader political and social concerns and questions of morality. All of that said, one can only hope that there is not some grotesque and decaying ‘Portrait of Mark Chu’ locked away in an attic above his studio in New York City. Nick: How did you find the review overall? Mark: Kind, and that anguish is in the eye of the beholder. Nick: Can you speak a bit about Francis Bacon: how you came to admire him, how his personal life informed the development of his artwork? Mark: At the beginning it was Bacon’s screaming mouth. But then Bacon’s color schemes and paint application began to seduce me, and his stories. 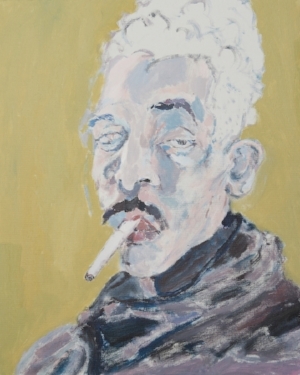 What a moving tale about his partner Dyer committing suicide two days before his huge Grand Palais opening, Bacon reacting nil to the public, then painting that triptych to reference that tragedy. Nick: Can you say something about colour: how you choose it, and your use of it in layering? Mark: Over this exhibition I’ve learned how to use the colors I find most difficult to paint with—yellow, for instance, which has a tendency of making everything muddy. One difficulty is to break away from the language associated with color, and to relinquish thinking of the standard terms to describe color. Words like ‘red’ and ‘blue’ are not only imprecise, but harm the planning of a well-considered image, as they correlate to too specific a hue. For instance, if you start thinking about ‘yellow’ it’s more likely you’re thinking about sunflowers or lemons than the yellow of amber. The color should be imagined first, not the word. Nick: How has your partner influenced your art, and does your art impact your partner? Do you have a Muse? Mark: She is a permanent supporter; aid, critic, fan, colleague, observer, archivist. What I love most about her is her strangeness, or her being unique without trying to be—I am much more pretentious—and the shared life we created, how irreversibly she changed me, how irreversibly I changed her. Nick: Can you elaborate on your fascination for the human face? Why do you paint more male faces than female? Mark: As an image, the face provides a lot of direct psychological meaning. And faces are easy to abstract because we naturally read faces even if their composition is altered. Men are easier to ask in person to portray, as more men seem okay with being ugly. But—many of the faces I’ve painted which I see as women, people see as men. I’d like to paint more women soon. 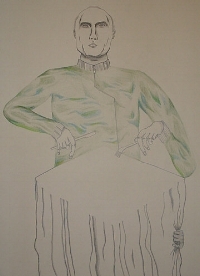 Nick: The first portrait I noticed of yours (below) was this arresting, bent figure with spindly limbs and fingers. That was 9 years ago, and your work has evolved considerably since then. How have you developed your style and skill set, and with what routine and coaching and resources, if any? How does this differ to your discipline/training as a musician? Mark: Every resource can teach, so to be constantly thinking about learning is important. That can make social interactions difficult as people sometimes prefer light conversation. Technique is vital—stamina and consistency too—strategy too. I’m not naturally disciplined, or humble. I’m perhaps more impulsive and indulged—so you have to trick yourself into not only being disciplined but knowing you require it, to train yourself into having better instincts and impulses. Not sleeping and eating regularly has been a colossal help over many years, but unhealthy habits like those can also erode mental health. Nick: What do you make of my reflection on the absence of politics in your work? Melbourne is a moveable feast in summer, and the 2018 St Kilda Festival made the offering all the richer with its February 4 tribute concerts to the late Amy Winehouse. In conjunction with the Jewish Museum of Australia’s exquisite ‘Amy Winehouse Exhibition’ (running until March 25), Memo Music Hall attendees were treated to a matinee offering of some of Australia’s most promising and established musical talents. Led by Darcy McNulty of Jazz Party, the ensemble brought to life the mixtape and catalogue of this once-in-a-generation artist. Sydney-based Elana Stone was magnetic and the most natural and entertaining performer of the afternoon, infusing the poetry of ‘Valerie’ with her smooth and soulful voice. Rita Satch was similarly compelling. As McNulty observed, Satch’s voice has developed over the past five years so that she now resonates elements of Amy's smouldering voice, appearance and movements behind the microphone. She was irresistibly groovy performing ‘Will You Still Love Me Tomorrow?’, ‘Mr Magic’ and ‘Stronger than Me’. The latter rendition demonstrated why Satch was the most adept at inhabiting the emotion and rhythm of Amy’s music. She communicated the soulful frustration of Amy’s life in a way that the other performers didn't, from infidelity and sexual disappointment to disintegrating relationships: “I just want to grip your body over mine / Please tell me why you think that’s a crime / I’ve forgotten all of young love’s joy”. 21-year-old wunderkind Alma Zygier was a revelation and probably the most unique and memorable vocalist of the show. Her otherworldly voice dripped with the sultriness and texture of some pre-War jazz singers (think Billie Holiday and Ella Fitzgerald), which was enchanting when set against a more lilting musical arrangement. Her rendition of classic ‘Body and Soul’ was sublime and spellbinding, and Zygier seemed far more comfortable in this space than she did in her moving rendition of ‘Back to Black’. While Zygier is undeniably a phenomenon and future star who ably captured the sadness and vulnerability underneath Winehouse’s exterior, one yearned for the confident, ribald and defiant maturity of Amy’s (or Satch’s) voice when performing Amy’s catalogue. (But perhaps I am just unsophisticated and possess an unrefined musical palate). Lachlan Mitchell closed out the matinee performance with ‘Rehab’. The best moment of this rollicking performance was when the band finally unbottled itself, allowing him to step into a more gravelly and full-throated swing: “I’m gonna, gonna lose my baby / so I always keep a bottle near / he said I just think you’re depressed / kiss me, yeah baby, and the rest”. Mitchell demonstrated a remarkable but understated and restrained charisma on stage. He was a kind of bashful generalissimo - hands mostly in his pockets - beckoning the other performers to dance on stage before they finally brought the house down with Amy’s biggest hit. The Jewish Museum of Australia, St Kilda Festival and Hear Them Holler should be commended for this outstanding cultural, historical and musical contribution to Melbourne. One reflects on the tragedy of Amy’s downward spiral and death, of the gaping hole she left in the music world, how her presence endures 7 years on, and how we waste many, many days not listening to jazz. My favourite live performance - "Sweet reunion Jamaica and Spain, we're like how we were again"